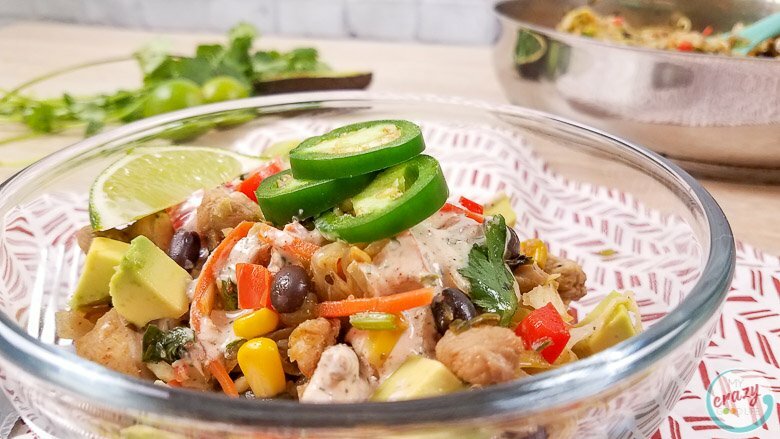 This delicious and healthy Southwest Egg Roll in a Bowl is an easy recipe to throw together after a busy day. 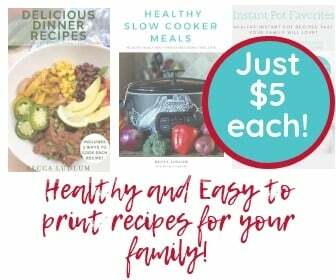 A family friendly dinner recipe that you can easily make spicy or mild, this is a healthy dinner recipe that you can make on the stove or in the Instant Pot. Some call this recipe a deconstructed egg roll or inside out eggroll–whatever you call it, it’s definitely one of my favorites! Even better? 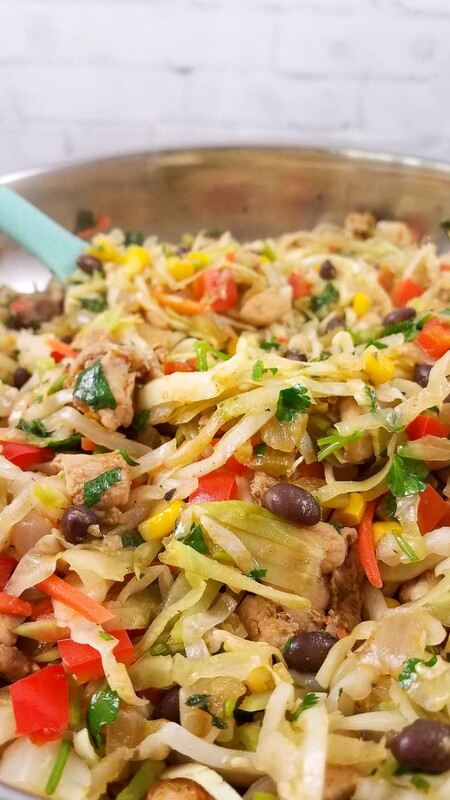 It’s a WW and 21 Day Fix Egg Roll Bowl recipe! 1. Heat the oil in a skillet on high heat. Add the chicken, onions, cumin, chili powder, and oregano to the skillet. Mix until the chicken is browned. 2. Dump the remaining egg roll ingredients to the skillet, except the cilantro. There is no need to stir–your skillet may be full, but the cabbage will shrink (a lot!) as it cooks. 3. Cover the skillet and reduce the heat to medium. Cook the egg roll filling for 10-15 minutes until the chicken is done and the cabbage has shrunk. 4. Remove the lid and mix in the cilantro. 5. 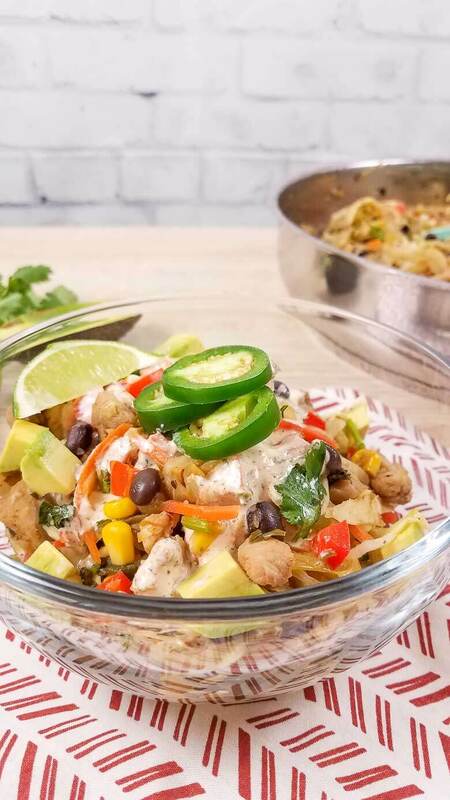 Serve in a bowl topped with homemade chipotle ranch dressing, avocados, jalapenos, and a lime wedge. 1. Add all the ingredients to a jar with a lid. 2. Close the lid and shake the dressing well. 3. Serve immediately or keep in the fridge for 2-3 days. 1. On sauté, cook chicken, onions, cumin, chili powder, and oregano in the Instant Pot. Cook until the chicken is browned. 2. Dump the remaining ingredients to the pot except for the cabbage and cilantro. 3. Add 1/4C chicken broth or water. 4. Place the lid on the Instant Pot and set your valve to sealing, cook on manual high pressure for 2 minutes. 5. Quick release and add cilantro and coleslaw mix, close lid and let sit for 2 minutes. One of my favorite things to order when we go out to eat are Southwest Egg Rolls–they’re crunchy and spicy and delicious. I’ve fallen in love with traditional inside out egg roll bowl recipes, but they never really satisfied me. But these southwest ones are on point, friends. Crunchy, a little bit of spice, and hella cilantro. Can I freeze this egg roll in a bowl? You absolutely can freeze this dish, but to be honest I don’t love freezing cooked cabbage. I feel like this recipe is best eaten within a few days. I definitely make it for meal prep, but I don’t like freezing it so I try to eat it within 3-4 days. I love these handy meal prep bowls for soups and dishes like this egg roll in a bowl. They have a spoon and a fork built right in! You can find all of my favorite meal prep containers on my Amazon Shop. Is this a quick Southwest Egg Roll Bowl recipe? It’s pretty fast–you can pull this delicious recipe together and have it on the table in less than 30 minutes, which is truly a win for me on a weeknight. Why is this considered a healthy Egg Roll Bowl? For this recipe, I chose to use ground turkey instead of ground pork or ground beef, which will save you some fat and calories. This recipe contains lots of veggies–bell pepper and coleslaw mix, along with red onion (instead of green onion) because of its anti-inflammatory properties. Also, the red onion adds a touch of sweetness that would usually be found with soy sauce or liquid aminos (or even coconut aminos). This recipe isn’t so much stir fried as it is sautéed until the coleslaw mix and ground turkey are golden brown and ready to eat. Is this a spicy egg roll in a bowl recipe? To be honest it completely depends on what you think is spicy! If you’re sensitive to spice, I’d leave out the chili powder and skip the optional jalapeños. Some people find green chilis spicy, so you might choose to leave those out as well, or at least on the side so you could add them slowly to your plate. I don’t think that skipping the chili powder will have a huge impact on the flavor of this dish–it’ll just reduce some of the spice. I really miss that egg roll crunch. Any ideas for me? Yes! I do think the best part of the egg roll is the outside–don’t we all? To help me feel like I’m really satisfied, I like to cut a whole wheat tortilla into thin strips and spray with coconut oil, then bake on a baking sheet or put on a pan for a few minutes until they crisp up. I add them right to my bowl and I have found that I don’t feel like I’m missing anything. 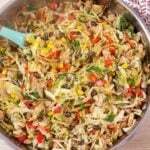 Another idea to get some more crunch out of this recipe is to use broccoli slaw in addition to the coleslaw mix or in place of some of it–it’s also a great way to get some extra nutrients in! I love adding ground turkey sausage in with the ground turkey for this recipe–it makes a big difference in the taste. Is this a low carb Egg Roll Bowl recipe? At 13 net carbs, this is a pretty low carb recipe. If you want to reduce the carbs even more, reduce the black beans and corn to 1/4 cup each or omit them entirely. You could also easily double the amount of ground turkey you use to increase the protein. Is this a 21 Day Fix Egg Roll in a Bowl? It is, of course! 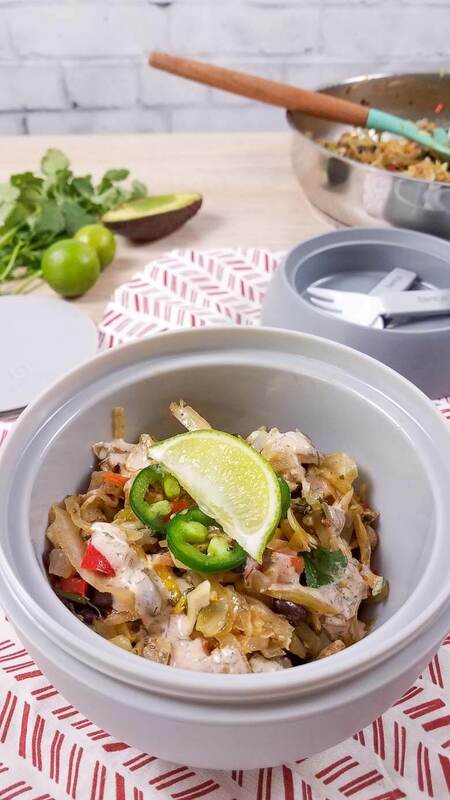 For the entire recipe, this 21 Day Fix Egg Roll Bowl counts as 2 red containers, 1 teaspoon, 6 1/2 green containers, and 2 yellow containers. The dressing adds one red container. I give you the counts for the entire recipe so it’s easy to re-calculate if you change something up. For example, if you decided to add a cup of broccoli slow to the recipe to add some crunch, you would increase the green container to 7 1/2, which then you could divide by the serving sizes (6 in this case) for your individual serving container count. If you need a picture, you can see exactly how my friend Teresa divides up her 21 Day Fix egg roll in a bowl here. For one serving of this recipe, you’re going to count it as 1/3 red, 1 green, 1/3 yellow and for the dressing, 1/6 red. Is this a Weight Watchers Egg Roll in a Bowl? Yup! All of these ingredients are relatively low in Freestyle SmartPoints and approved for Weight Watchers. One serving of this recipe (divide the recipe into equal portions) is 3 Freestyle SmartPoints. If you use nonfat greek yogurt, the dressing is free. Make sure that if you change any of the ingredients, you add this recipe back into the Weight Watchers points calculator to make sure it’s as accurate as can be. Using full fat or lowfat yogurt, different ground turkey, or ground turkey sausage will all change your points. Heat the oil in a skillet on high heat. Add the chicken, onions, cumin, chili powder, and oregano to the skillet. Mix until the chicken is browned. Dump the remaining eggroll ingredients to the skillet, except for the the cilantro. No need to stir, your skillet may be full, but the cabbage will shrink as it cooks. Cover the skillet and reduce the heat to medium. Cook the eggroll filling for 10-15 minutes until the chicken is done and the cabbage has shrunk. Remove the lid and mix in the cilantro. Serve in a bowl topped with chipotle ranch dressing, avocados, jalapenos, and a lime wedge. Add all the ingredients to a jar with a lid. Serve immediately or keep in the fridge for 2-3 days. On saute, cook chicken, onions, cumin, chili powder, and oregano in the Instant Pot. Cook until the chicken is browned. Dump the remaining ingredients to the pot except for the cabbage and cilantro. Add 1/4C chicken broth or water. Place the lid on the Instant Pot and set your valve to sealing, cook on manual high pressure for 2 minutes. Quick release and add cilantro and coleslaw mix, close lid and let sit for 2 minutes. Weight Watchers Smart Points: 3 Freestyle SmartPoints per serving, if you use nonfat greek yogurt, the dressing is free. Air fried wonton wrappers maybe for the crunch or oven baked? Yes! As long as you’re not on the Fix (they’re not approved} that would be awesome! I am drooling. This would be such an amazing meal! I need to make it one day for sure. I love egg rolls. This has an exciting flavor profile! The idea of a bowl but with the spicy goodness of mexican food. Divine! OK now this sounds delicious! What a great idea of something different to do for a meal. I bet it tastes delicious. 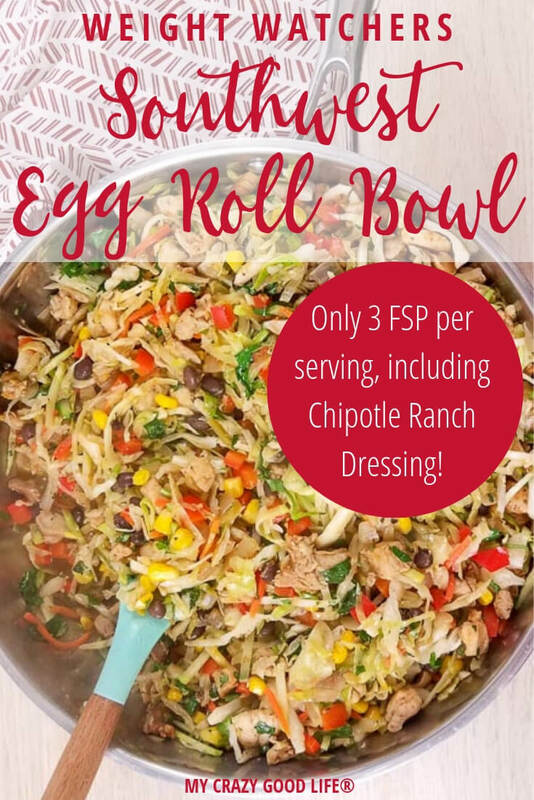 omg egg roll in a bowl is our favorite but i never thought to make a fun way like with chiptole and ranch! YUM! def going to add it to my list for next week! This looks so delicious! I love southwestern inspired meals. If this tastes half as good as this looks, my family and I are going to be in for a treat when I make this. We love egg rolls of every kind so I know it will go over well in my home. The 21 day fix. How would you portion it out as servings? I see the break down , is that for thw whole thing or just one serving? This looks super tasty and I love how colorful it is. Bookmarking for the next potluck I attend! I love egg roll! This one looks so yummy, and I love how you incorporated southwestern inspired flavor! The best comfort food! I would like a big bowl for dinner! That looks good! But yeah, I’m sensitive to spice so I will have to leave the chili powder out. It sounds like a great meal! I’ve never tried a combination like this! I love the idea of having a healthy bowl like this. I have been making a variety of salads lately, and this looks really good. The coleslaw mix sounds delicious. Could you use chicken breast?